Welcome to a unique Orlando vacation experience... Star Island Resort & Club. Star Island Resort & Club is a 5 star luxury resort near Walt Disney World located in Kissimmee, Florida. A Mediterranean-styled resort and spa featuring two and three bedroom, two bath villas that are designed for ultimate comfort and luxurious living. Every 5 star luxury villa, with up to 1,350 sq. ft., has award-winning design furnishings and an array of lavish accents that you would only expect to see in a celebrity home. Imagine... all the fun of the Disney area, elegant villas and a world class resort - all yours to enjoy at Star Island Resort & Club. From the moment you drive over the lion's head bridge and past the guarded gate, you know you're someplace very special. The waterfall pool is so elegant, you may just want to stay right there. A lovely fountained lake meanders through this elegant resort. The spa and fitness center showcase some of the many sports celebrities who have visited here. Every amenity is world class so try them all. 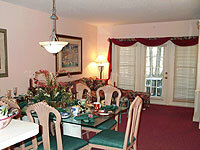 Convenient to WALT DISNEY WORLD® and other major theme parks. Vic Braden's "scientific analysis of sports performance," physics, physiology and psychology are important aspects of his training technique. The Tennis College includes 8 courts, a stadium center court and 6 patented geometric practice lanes allowing guest to hit 900 balls per hour. Whether you are an advanced player or beginning, the Vic Braden Tennis College at Star Island will exceed your expectations. Star Island's world class Spa near Disney offers a full menu of pampering and therapeutic treatments that are relaxing, soothing and re mineralizing. Our professional staff invite you to experience a therapeutic massage, seaweed wrap, or full body mud mask. You can soothe sore muscles, relieve stress or choose from one of our many salon services that promote a healthier lifestyle and sense of well being. For the active guest, Star Island offers a variety of recreational activities. Celebrity Fitness at Star Island offers the latest in fitness technology and traditional therapies. Spacious workout facilities, challenging aerobic schedules and unique exercise programs are supervised by a staff of certified personal trainers. Looking for a little excitement? Head on over to Lake Cecile where you can choose from jet skiing,water skiing of watersports. Or improve your golf game at our driving range and putting green. 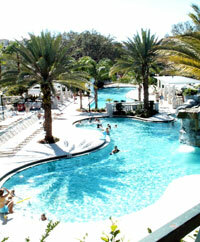 At Star Island Resort & Club, you'll have lots of what Florida is famous for... sunshine, fun and relaxation. From its beginnings in the French Alps in the late 1960's, vacation ownership has become the fastest-growing segment of the U.S. travel and tourism industry, increasing in popularity at the rate of nearly 16 percent each year since 1993. Today, more than three million households own vacation intervals at nearly 4,500 resorts located in 81 countries. Vacationers around the world are turning to vacation ownership resorts as their preferred travel destination, with timeshare owners hailing from 174 countries. North America remains the global leader with nearly half of all the resorts and approximately two million owners. Europe is the second most dominant region for vacation ownership, with approximately 22 percent of owners worldwide and more than 1,000 resorts. Timeshare resorts are found across the globe in popular vacation areas near beaches, rivers and lakes, mountains and even major cities. By locking in the purchase price of accommodations, vacation ownership helps to assure future vacations at today's prices at luxurious resorts with amenities, service and ambiance that rival any of the world's top-rated vacation destinations. Through vacation exchange programs, timeshare owners can travel to other popular destinations around the world. With unparalleled flexibility and fully-equipped condominiums which offer the best in holiday luxury, vacation ownership puts consumers in the driver's seat, allowing vacationers to plan and enjoy vacations which suit their lifestyle. Timeshare resort developers today include many of the world's leading hoteliers, publicly held corporations and independent companies. Properties that combine vacation ownership resorts with hotels, the increasingly popular urban vacation ownership resort in major cities, adventure resorts,and gaming resorts are among the emerging timeshare trends. The reasons for purchasing most frequently cited by current timeshare owners are the high standards of quality accommodations and service at the resorts at which they own and exchange, followed by he flexibility offered through the vacation exchange opportunities and the cost effectiveness of vacation ownership. Nearly one-third of vacation owners purchase additional intervals after experiencing ownership. This trend is even stronger among long-time owners; 41.2 percent of those who have owned eight years or longer have purchased additional intervals within that time. The developers of Star Island Resort & Club offer the following discounted vacation packages for those that meet resort qualifications. JUST $169.00 + tax !! JUST $179.00 + tax !! JUST $129.00 + tax !! JUST $139.00 + tax !! No Star Island resort stays available till further notice. This advertising material is not an offer to sell nor a solicitation of an offer to residents of any state in which registration requirements have not been fulfilled. This offer is designed for those interested in vacation ownership, aged 25-65 for couples and 28-60 for single women, with an annual household income of at least $40,000. Attendance at a 90 minute plus timeshare presentation is required. 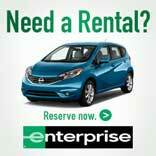 Not valid if you've toured our resors within the last eighteen months. Residents of Brevard, Volusia, Lake, Oseola, Orange, Polk, Seminole, Miami Dade or Broward counties do not qualify for this offer. Mini Suites - Sleep up to 6 - Master bedroom has 2 double beds, bathroom with a 1 person whirlpool tub and den by day with queen sleeper sofa and mini kitchen. Mini-kitchens include mini fridge, microwave, toaster and coffeepot. One Bedroom Condo/Villa - Sleep up to 4 with master bedroom with king bed,fully equipped kitchens,washer& dryer and living /dining room with queen sleeper sofa. Two Bedroom Deluxe Condo/Villa - Sleep up to 10 with master bedroom with king size bed, 2nd bedroom has 2 double beds with fully equipped kitchens,washer& dryer and living /dining room with queen sleeper sofa and whirlpool. 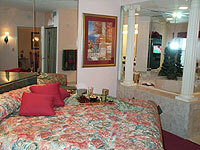 As a bonus this condo/villa includes the den with an additional queen size sleeper sofa and mini kitchen. Master bathroom has 2 person whirlpool tub and guest bath has 1 person whirlpool tub! !